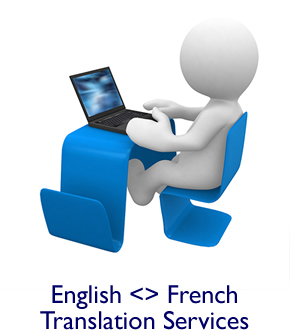 English to French translation services by professional French translators. Our marketing and creative translations are most suitable for almost all media projects. This maybe translating into French or English for packaging, marketing or promotional materials, even exhibitions etc. To sell to foreign customers on your website, you need to speak their language especially with French being one of the most widely used languages. It is now widely recognized that translating or localizing your website is by far the most cost effective way of increasing the client base for your e-commerce site or web application. Contact us for a french translation quotation for your website. Our English-French translation service for business documents include contracts, manuals, spreadsheets, powerpoint presentations, training material and much more. If you're looking for a fast service to translate your minutes, notes, announcements, emails and other correspondence into French, this service is for you. This translation service can be provided on an on-going retainer contract giving you a set cost each month. Contact us for more information about this french translation service. We also perform related French translation services including desktop publishing and design, transcription, copywriting, HTML and PHP theming and template integration and website localization. Please request a quotation by using our french translation quotation form. French proof-reading service also available. I Webb Language Services provide English to French translation services, French proofreading services, online French tutoring and one-to-one French lessons in the Hartlepool and Seaton Carew areas.